I’m a great planner — an aspect of my personality so ingrained that it rarely faded during 10 months on the road. Even removed as I was from the rigours of Western life, away from the myriad rules and regulations that simply don’t apply in other parts of the world, the need to strategize remained a strong force inside me. Most of the time that is. There are good reasons to plan. You’re less likely to end up staying in terrible accommodations or eating food you can’t stomach; you’re less likely to miss out on star attractions; you’re far more likely to stick to your budget and be able to afford everything you need. But even I can recognize that there are times when it might just be worth throwing off the shackles of organization and striking out blindly. And I found that this was ever so much easier to do in a country full of smiling faces, hot sunshine, clear weather and with pocket-friendly living costs: Cambodia. We’d arrived in the riverside town of Kratie after a seven-hour drive from Siem Reap — the latter few hours of which was spent in the back of a minivan with poor suspension, loose seats and a television in place of a rear-view mirror. Our only fellow Westerner — an American lad beside me — was laid back enough to wait for half an hour before demanding the driver stop watching his soap-opera and concentrate on the road. I say “road,” but it was a potholed dirt track that gradually worsened as we got closer to Kratie. I’d booked (of course I had!) a room at the Balcony Guesthouse, one of a handful of smart little hostels overlooking the teal-coloured river and far bank of white sand. There’s not much to see and do in Kratie itself, but travelers are starting to come here thanks to community-based ecotourism project the Mekong Discovery Trail, established to help draw income to this little-visited corner of the country. The headquarters for the Trail is at the tourist information center in town, and along I trotted, boyfriend in tow and a notebook tucked under my arm. It turned out I didn’t need it. The lady had very little to say, other than to give us a concise leaflet and to assure us that our overnight bicycle trip would all work out fine. She stood on the doorstep, shielding her eyes from the hot sun and pointed to a garage down the street. “And where can we sleep?” I asked. I had read that local families offered home stays. “Yes, yes,” smiling again. “Blue sign,” she explained, drawing a small square in the air with her index fingers. Well that was that then. We feasted that night on the terrace with samlor after stocking up on food for our journey. One thing I can’t bear is the idea of being without food. We left early the following morning under cobalt blue skies and on ground already roasting underfoot. 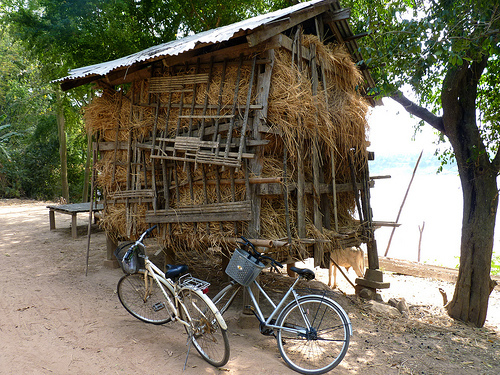 My bike began creaking less than a mile into the journey to Koh Pdau, a river island 20 miles north of Kratie. But it was hard to care. Through the sweat rolling down my face, the Mekong was the best I’d seen it in my travels through Laos and Cambodia. It was the bright blue of digitally-altered postcards — a miniature Caribbean Sea fringed with pure white beaches and dotted with little green islands. Hamlets were bursting with friendly children, eager to wave and call out hellos and goodbyes, often in the wrong order. 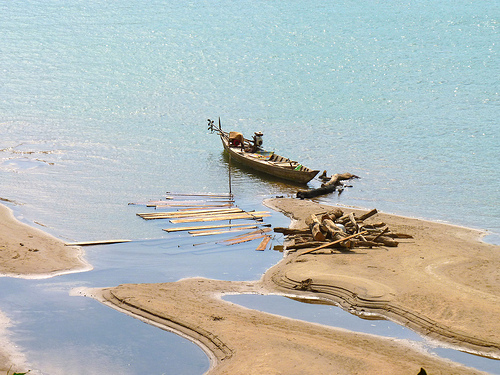 Some travelers visit the area to spot the endangered Irrawaddy dolphin, and we stopped for a little while at Kampi — one of the best viewing spots — before carrying on to the small town of Sambour in the 85-degree-Fahrenheit-plus heat. A few miles north, we found the Koh Pdau ferry port tucked into what seemed to be someone’s backyard just as the sun dipped towards the horizon. The boatman dropped us and our bikes on the tip of the island and we scrambled up the steep slope into a sun-scorched rice paddy wilderness. It took almost an hour to find the hamlet of houses that might contain a bed for the night and then a few moments to realize that every single dwelling had a blue sign outside, displaying its address. Children ran around us, laughing and poking at our skin, pink from the sun. We eventually found another type of blue sign labeled “Chap Sary Home Stay,” and after some cautious knocking followed by various people and a menagerie of small animals fussing around us, we were welcomed into the communal living space. The family spoke one word of English (hello) and we spoke two words of Khmer (hello and thank-you). We waited for dinner on the balcony as we watched the sunset. I worried nervously whether food was even on the agenda, and wondered how much money this would all cost. But dinner did, of course, arrive; a banquet of different dishes that we ate on the floor of the only room while the family nattered outside. We awoke beneath our mosquito net in the low light of early morning to a cacophony of animal noises that started before dawn, dragging ourselves out of our corner for a breakfast of fish, rice and omelet. Settling the bill was interesting. Hand signals that I’d previously believed were understood worldwide had zero effect — generating nothing but blank stares — but in the end everyone seemed happy. Cycling back to the ferry stop, we jumped aboard the wooden boat as it continued across the river. This side of the Mekong was even quieter — the roads and rickety wooden bridges barely suitable for anything bigger than a motorbike — and the adults just as keen as the kids to yell greetings at us. After a long, sweltering cycle, our final ferry hop involved wheeling our bikes across a huge sand dune, waiting for an hour in the afternoon heat and sharing our brief voyage with some aquaphobic cows and a mischievous-looking boy laden with coconuts and a huge machete. It was a couple of days as unforeseen as it was unforgettable. Maybe next time I open the laptop to research my next destination, I’ll hold back: I’ll hold out for something unplanned. Holly Cave is a travel writer, science writer and part-time landlady based in the UK. When she’s not penning a sci-fi dystopia, pulling a pint, or walking her dog in the gorgeous English countryside, she’s writing about travel on her blog Travel Each Day. You’ll also find her on Twitter and Facebook.